The CRYS36S has 3 main sections. Water drains from the tank into section 1 through the 100 micron provided filter socks. Section 1 is typically where the protein skimmer sits. Water then flows through a slit in the first baffle into section 2. Section 2 is typically used as a refugium. 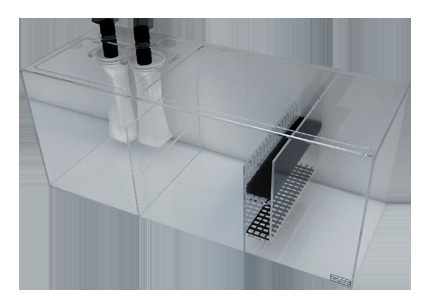 If a refugium is not desired, then the protein skimmer or other equipment can be housed in section 2. The water then flows over the second baffle through 2 perforated platforms and under the third baffle into section 3. The top perforated platform holds the included foam block filter and the bottom platform is open to use for several different filtration methods (bag of carbon, bio balls, rubble rock, etc.). Section 3 is the return section where the return pump will sit, pumping water back to the display tank. There are two platforms in the area before the return section. The top platform comes with a foam filter block and the bottom one is open to use for several different filtration methods (bag of carbon, bio balls, bio sponge, heater, rubble rock, etc.). Tabs are located on the top support brace in front of the 1” bulkhead fittings. The purpose of this tabs is to provide a location for tying off 7” diameter filter socks that have drawstrings. The 7″ socks allow for longer times before the filter sock gets clogged and needs to be cleaned or replaced. Filter socks snap and lock into the filter sock holders to secure the sock from falling out when it becomes clogged. The 4” filter socks are 100 micron rating.